What does a lemming look like? 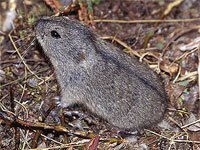 The lemming is a tiny rodent that is found in or near the Arctic Circle and are thought to be related to voles and muskrats. The smallest species of lemming is the wood lemming measuring around 8 cm. The Norwegian lemming is roughly three times the size of a wood lemming and is one of the largest species of lemming. 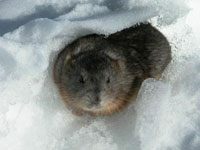 Lemmings have small, stout bodies and short limbs, ears and tail in order to allow the lemming to conserve heat more easily in the bitter Arctic winters. 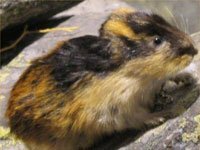 Lemmings also have sharp little teeth which helps the lemmings to gnaw through tangles of roots. There are nearly 30 different species of lemming found around the Arctic Circle, from Alaska to Siberia. 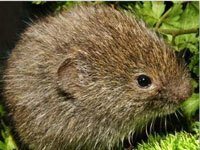 Although many different species of lemming have been recognised, all lemming species are pretty much the same apart from where they live and so the lemming species tend to differ most from one another based on what the lemmings can find to eat. What does a lemming eat? 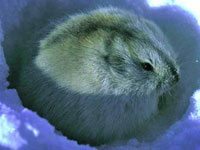 Lemmings do not hibernate and instead endure the tough Arctic winters, with the lemming having special protection from the cold from its thick fur. The lemmings spend the winter searching for bulbs and shoots that are often buried beneath the snow. The food that lemmings eat is not very nutritious, so lemmings must eat lots of it. Lemmings spend around 6 hours a day searching for food and have breaks in between hunting, during which the lemmings rest. Lemmings reside in burrows beneath the snow to keep them warm and safe from predators that lurk on the surface of the snow. What are the natural enemies of the lemming? 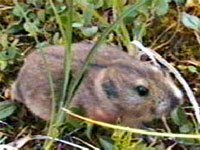 The lemming is easy prey for most meat-eating mammals and birds. Do lemmings jump off cliffs? The theory that older lemmings consciously jump off cliffs in large numbers in order to let the younger lemming generations have full access to food and shelter etc is a myth. This may have originated from the mass migration of the Scandinavian lemming when food becomes scarce, that run in their hundreds through the surrounding terrain in search of food, with a few unlucky individuals finding their way off cliffs. Download free Lemming wallpapers, click on the image to open the large version. Print free Lemming coloring pages, click on the image to open the large version.